Vladimir Guerrero Jr. is a baseball talent for the ages, and the Vladimir Guerrero Jr. rookie cards appear likely to set the Hobby on fire. As collectors wait for his inevitable MLB promotion, there are already several key cards to keep an eye on. 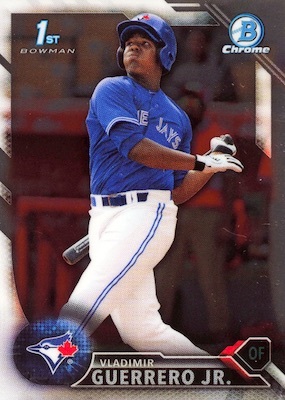 The son of Hall of Fame player Vladimir Guerrero, Vlad Jr. quickly made a name from himself after signing with the Toronto Blue Jays as an international free agent in 2015. Since then, he has burned through the Blue Jay's minor league system with all roads leading to Toronto. The first Vladimir Guerrero Jr. cards came in 2015, but the most popular early releases are his prospect cards in 2016 Bowman sets. 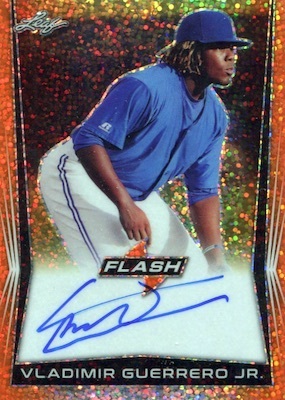 See Also: Real-Time Guide to the Hottest Vladimir Guerrero Jr Cards on eBay. For collectors, the next big cardboard milestone is the release of the Vladimir Guerrero Jr. rookie cards. Looking likely to happen at some point in the 2019 Baseball card schedule, the official RC versions can't be produced until after he joins the major league roster. Nevertheless, the phenom has several notable choices documented below and the rookie cards will add even more to the mix. These will not be available until after he makes his MLB debut with the Blue Jays. Click on the card listings below to shop for specific cards or track prices on eBay. Bolded sets go directly to detailed product profiles. 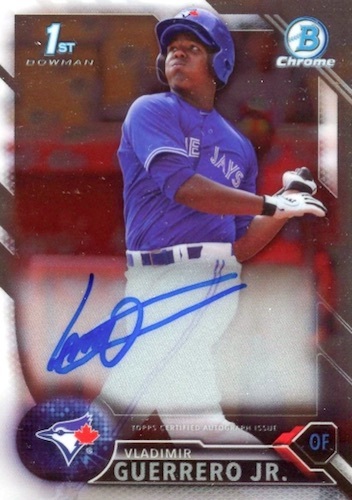 The earliest certified autograph of note for Vlad Jr. came in 2015 Panini Contenders Baseball. 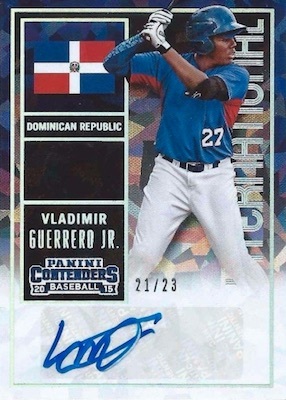 Instead of the famed Rookie Ticket, collectors can find the Vladimir Guerrero Jr. International Ticket autograph. Also working with a sticker signature, the card displays the Dominican Republic flag. There are several levels of parallels, as well, including the Cracked Ice (#/23) version shown below. 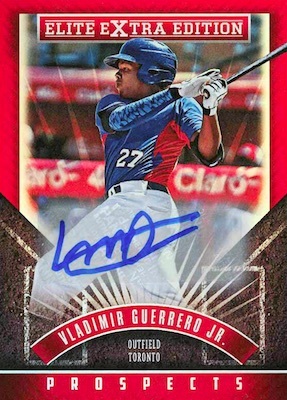 If you want another top Vladimir Guerrero Jr. card from his first year, that's his 2015 EEE autograph. Sure, the sticker autograph is not ideal, but this is among his best non-Bowman options. Parallels include low-numbered die-cut editions. Looking for something easier on the wallet? He has a base card and multiple parallels, plus a few inserts, in the EEE set that remain fairly cheap. Although there are many good options out there, the best Vladimir Guerrero Jr. card is found in 2016 Bowman Chrome Baseball. 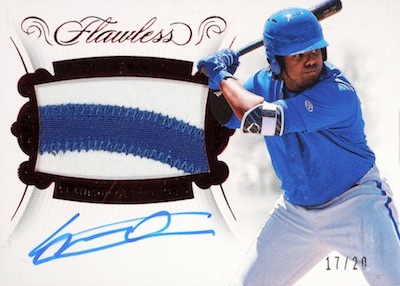 The hard-signed Bowman Chrome Prospect Autograph card has already produced some staggering sales with several breaking the five-figure mark in 2019. Of course, most of these higher prices are associated with the high-graded, low-numbered colors in the Refractor rainbow. Remove the signature and you get the prospect card in 2016 Bowman Baseball, which is a much more affordable card for Guerrero. Issued in a base paper and a Chrome style, many chase the Refractor parallels. These also produce strong prices, including several of the rarest editions that can eclipse $1,000. Not on the same level as the primary Bowman brand, 2016 Bowman Platinum Baseball is a Walmart-only release that mainly features top prospects and rookies. 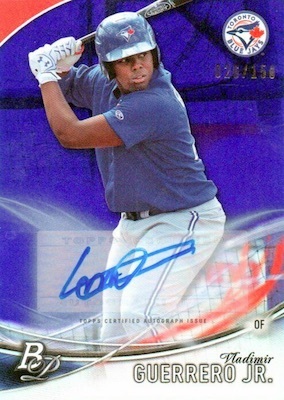 Vlad Jr. is the key name in the Top Prospects set, which has a sticker autograph version. It appears he only has parallel versions, though, including Purple (#/150), Green (#/75), Orange (#/25), and Black (1/1). He also has sticker autographs in the Platinum Cut (#/25) and Platinum Presence (#/75) inserts. Arguably his best prospect release other the Bowman Chrome autograph, 2016 Bowman's Best Baseball is signed on-card and is also very popular. Another plus is the more distinct design. While it will never match the CPA card, it is a fantastic consolation prize. One of the first truly high-end options for Guerrero came in 2018 Flawless Baseball. Numbered to only 25, the card takes a premium approach across the board. The only knock against it is the lack of MLB logos, but this is easy to overlook. Going another direction, the Vladimir Guerrero Jr. prospect autographs in 2018 Leaf sets are mostly signed on-card and can be much more affordable than his Topps and Panini cards. The trade-off is the licensing, but collectors that don't mind this can open up even more variety in the market. His autograph cards are found in 2018 Leaf Flash Baseball, 2018 Leaf Metal Draft Baseball, 2018 Valiant Baseball and 2018 Ultimate Draft Baseball. Signed cards are also expected in 2018 Leaf Trinity Baseball. 2016 Vladimir Guerrero Jr. Panini Donruss Optic Studio Auto Graded 10 10 PSA!!! !